My mommy likes to pamper me with practical gifts. Look what she got me for Xmas. 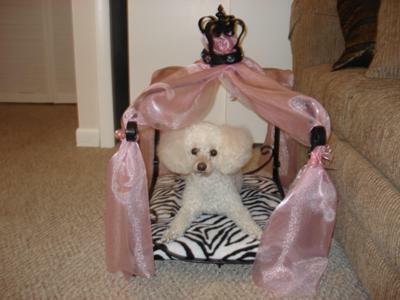 A lavish bed topped with a jeweled “crown” and a decadent animal-print velvet pad. She decorated it with pink canopy curtains to add a royal splendor look to it. She didn’t spend a lot of money on this bed. She is smart! My mommy is pawsitively awesome; she makes me feel like a Pup Star! A kourteous k-9 as I am, I thanked her with love kisses! If I were a kitty cat I would say, “Purrrfect”, but because I am a puppy I say Woofunderful!